Photographers are always looking for the perfect camera, even in these days of high megapixel, large sensor, programmable cameras. The selection for many has become more than just a choice between manufacturer loyalties, as it extends to technical demands, and practicality when approaching a particular subject. There is no doubt in my mind that some of the finest landscape and scenic photographs have been produced, and continue to be made, with the type of camera that is a design that has been with us for over a hundred years, the “view” camera. The great nature photographers Elliot Porter, Ansel Adams, Imogene Cunningham, and Brett Weston used them, and many publications still prefer the quality of 4×5 inch, or larger, sheet film (some readers may never have even seen film). A local photographer, Peter, stopped by the other day to talk about a 4X5 Burke and James view camera he had purchased. Photographers can easily obtain moderately priced, used, 4×5 inch format film camera by manufacturers like Burke and James, Graphic, Sinar, Linhof, Calumet and many more, that, depending on the use, are similar in application to DSLR (digital single lens reflex) cameras in that there is an extensive array of lenses available, but unlike DSLR’s there is not a limiting lens mount. One must merely find a lens board that has a hole in it the size of the lens you want to use and voila, the camera is ready to go. For those unaware of just what a view camera is I’ll describe it as an accordion looking contraption, consisting of a flexible light-tight bellows with a focusing screen and film holder on one end, and a lens board and lens on the other. This assembly is usually mounted on a rail or platform and uses a rack and pinion system to move the bellows back and forth for focusing. The main advantage of view cameras is the technical control that one can get because both the front and back have the means available that allows for up, down, and lateral movement. At one time some cameras like his were called “press” cameras because they were the camera of preference for news photographers (seen regularly in old movies), so depending on what the source is the camera might be called a press, field, or large format view camera. I know that may be confusing to those that have only used DSLR type cameras, but volumes have been written about using view cameras and if you are interested information is readily available and I suggest starting with http://www.viewcamera.com. Simply put: Consider being able to move a digital camera sensor and lens at different angles. Light certainly doesn’t go around corners, but with a view camera one can change perspective, control distortion, and sharpen an area of focus just by aligning film, lens and subject. For example, walk up close to a tall building, aim the camera upwards, and release the shutter. The resulting image will show the building having a wider bottom and narrower top. With a view camera one can adjust the film plane and lens plane positions parallel with the building’s wall, and of course this would be easy to accomplish because between the film and the lens there is a bellows that bends easily. This time the resulting image would not be wide at the bottom and narrow at the top, but whatever, the photographer set it to. It is this control, and not so much the large negative, that draws serious photographers to view camera technology. However, the large 4×5 inch negative does produce impressive results. Although one would traditionally need a photography darkroom with enlarger, chemicals and trays for processing and printing, many modern photographers now use scanners. The film still must be processed, but once done just scan that beautiful, large sheet of film into a computer and then proceed as usual into PhotoShop for image enhancing and printing. Peter plans on taking his 4×5 on some hikes in and around the British Columbia interior. That’s a neat thing about these foldable cameras; they collapse nicely into a portable box. With a lightweight tripod, a few sheet film holders, and a camera that is easily stuffed into a small backpack, he’ll be on his way. The hills are covered with snow, but if the light is good I know he’ll have a great time there and I look forward to seeing his resulting pictures. This photographer isn’t sure about an advertisement television. Currently, there is an advertisement being shown on television with the goal of convincing new camera owners to purchase more another lens for their new DSLR camera. The ad begins with a picture of little girl in a playground. Viewers see the child in the foreground with lots of stuff behind her. Then as viewers are told to purchase a better lens the picture changes to a sharp portrait of the child with a soft out-of-focus background. The subject much remains the same, but, because the clutter in the background is diminished, now the portrait is more pleasing. Viewers are given the impression that there is a special type of lens made specifically for portrait photography and to buy it if we want good portraits. I agree that buying the best quality lenses will give photographers the highest quality image, however, the difference between the two pictures viewers are shown doesn’t really have anything to do with good quality lenses. Any photographer can easily create the effect of a blurry background by using the same lens (or any lens) by choosing a wider aperture to reduce the depth of field. Depth of field is defined as the area around the main subject, in front of, and behind, that is in acceptably sharp focus. The smaller the aperture the greater the field of focus is, and the larger the aperture the less the field of focus, thus by focusing on the subject and reducing the field of focus, much of the area in front of, and behind, the subject looses sharpness. In my opinion learning to use a camera effectively is more important than falling for the hype put forward in ads like that. All photographers should learn about depth of field, composition, and metering. They should have an understanding of perspective, and why at times subjects in the foreground seem uncomfortably larger than those standing only a few feet behind. Fast action is easily controlled by increasing the shutterspeed, and if the elements in the picture aren’t bright enough, by increasing the camera’s ISO. Sharpening the landscape on a bright sunny day only takes the additions of a lens hood to reduce lens flare; and, as always, in my opinion, the best scenics are those where the photographer uses a good sturdy tripod. I advise saving some money and purchasing a book on portraiture, or, at least basic photography instead, and there are lots of online forums where photographers show, discuss, and exchange advice on their pictures. Or, readers could take a class. The voice in the advertisement advises that photographers can change from a good shot to an amazing shot if a better lens was purchased. I regularly talk to photographers that believe the only way to make better pictures is to buy a new camera, and I expect because of that advertisement they will go out and purchase new lenses in the misguided belief that they will suddenly become better at photography. What I actually like about the ad, in spite of the not so truthful claim that a good portrait is only accomplished when one buys another lens, is that it gets photographers thinking about adding to their collection of lenses. All camera manufacturers (just like auto manufacturers) have various levels of quality and one type of lens isn’t necessarily the best for all subjects. As long as I have been involved with photography the catch phrase “it’s all in the glass” has been around. And I regularly tell those new to photography that they should be changing lenses before changing cameras. Nevertheless, I also tell them that they should know what they expect from a lens before purchasing it; and after researching it to match their expectations with what they can afford to acquire. There isn’t necessarily any lens that might be called a portrait lens and the selection of which lens to use is really up to the photographer. I think an in depth discussion of lenses is best left to another time. The other night I was rummaging through my collection of old photo magazines and I came across the 1964 issue of “US Camera”. As I casually thumbed through it amused by the ads on equipment and how-to tutorials on printmaking I came across a very interesting story by the famous photographer Margaret Bourke-White about her beginnings as a photographer in the 1920’s. The short story was an excerpt from her book “Portrait of Myself”. Specifically, I enjoyed the part about her trials and successes photographing the Otis Steel Mill in Cleveland. She talked about how hard it was to capture the interior of the mill that to the eye was more than illuminated by the molten metal, but was extremely underexposed and unrecognizable on her film. In those days film and photographic paper had little latitude and the film emulsions were very slow, probably 50 ISO at most. She further talked about how excited she was when she was able to borrow a “fast” f/3.5 lens. And even then her exposures were inconsistent, sometimes over exposed, sometimes under exposed. Her success finally came first by using big magnesium flares for illumination, then with new photographic print technology for that time that contained very heavy deposits of silver therefore giving it a “long gray scale”. Her amazing photographs in 1928 were probably the first pictures of those kind ever made. All this got me thinking about how far we have come since those days of heavy view cameras accompanied by large, unwieldy tripods, Sheet film was barely light sensitive and had to be carried in special holders, and lenses normally had their widest apertures at f/6 and were thought to be wide opening if they had apertures of f/3.5. The lighting equipment was extremely dangerous, inconsistent and consisted of either magnesium flairs or flash powder. And after all that a photographer needed to have extra processing skills when using crude printmaking equipment that more than likely was a combination of home made enlargers and shelves of chemistry to mix different developers. Today depending on how large a print we want to make we can either select a camera with a large sensor or upsize our image in programs like PhotoShop and Genuine Fractals. Tripods have become lightweight, durable and strong. We select the best tripod head for the camera and lens combination we are using and install that. Many of the super telephoto lenses have apertures of f/6, but lenses at 200mm or shorter with apertures of f/2.8 are common. And remember using that 200mm on a digital camera may give a crop that is effectively 300mm. Lighting equipment has become amazing and we have just as much choice with electronic flash as we have with digital cameras, maybe more. I am amazed at the process Bourke-White had to go through to get a clear, well-exposed image in those steel mills. As I read that article I thought about how far we have come since those days and how easily it would be to photograph those scenes with today’s equipment. We could first select a camera that allowed a high ISO and a lens with an f/2.8 aperture. Wait, many of us have f/2 and f/1.4 lenses, so they would allow even more light gain. Heavy cameras and tripods are no longer an issue. Together the average DSLR (digital single lens reflex) camera with a “heavy” f/2 lens and tripod probably weighs less than four pounds. Lastly there is lighting that is now easier with light meters and digital cameras. Some photographers may use powerful studio equipment while others could make do with several small flashes positioned around an interior using slaves to fire them off. This is a very exciting time for photographers. Photography has become so accessible and the advancements in technology can free beginners from the tedious mathematics, expensive film testing, and dark chemical filled rooms. Yes, I think this is a very exciting time for photographers. Margaret Bourke-White spent close to 30 years as a staff photographer for Life magazine and had her photography published in numerous books and magazines. If interested check her out, there have been several books written about her and much about her is easily accessed on the internet. For me New Year’s resolutions aren’t so much resolutions for the next year, made on January 1st, but things I’ve been thinking about for some time. These could be more accurately called photography goals for 2012. Here are some of my goals as well as my thoughts for each for this year. There are not very many goals, but too many doesn’t seem to work for me. 1. Plan a trip or photographer’s vacation this year. I want my time to be about photography, not one of those trips where I bring along a camera and hope for a snap shot or two, but a real photographer’s excursion that makes me use the equipment, knowledge, and talent I have. 2. I want to make the effort to learn new techniques by taking a class, or at least buying some books or CDs written by accomplished photographic writers. Educating oneself is always fun. 3. I will continue my ongoing quest to organize my old prints and slides. I want to place as many as possible on archival CDs. There are many ways to copy photographs and slides. For prints I use my camera, a tripod, and a level, to make a digital photograph. For slides a scanner works best. My scanner, although capable of producing high-resolution scans only produces one film image at a time and is slow. There are scanners that will do multiple slides and several formats at a time and the price for them is under $1000. Maybe this is my year for a new purchase. 4. Like many long time photographers, I have old film camera equipment whose time of service has long past. The pictures they produced were great, but modern camera technology has progressed far beyond those old film cameras, and individuals like me, who have embraced the high quality digital world, will never return to film. Fortunately, there are high school classes that are still are using chemical darkrooms and black and white film that has students looking for inexpensive old manual cameras and that is a much better place than gathering dust in my basement. 5. I am planning to do a systematic photographic inventory of our household goods. I have to admit I am as lax as anyone when it came to a photographic home inventory. Then I was faced a couple of summers ago with a forest fire approaching my door and needed to do it in a hurry. I have that quick and haphazard photo-inventory, but now it’s time to do it right. It’s not very hard if one does it one room at a time, and I think worth the effort. 6. For me, my store is a great place to interact with others interested in photography, and I have a few chairs available, and it is just fun to just talk about photography. My advice for those that don’t have my convenience, is make the time to get together with other photographers with no other goal then to talk about or do photography, and if you already have been occasionally participating in a club how about searching out photographers specifically interested in the kind of subjects you like to photograph, for example, collaborate with like minded enthusiasts in a macro, scenic or birding group and start planning an outing or just get together for refreshments and talk at some local spot. 7. 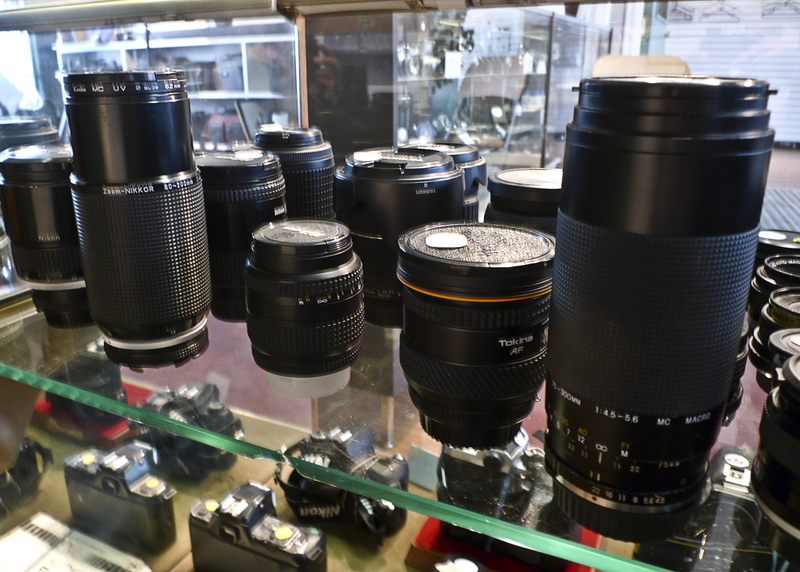 I could add a lens and make it one of my goals for this year, but because of my shop camera equipment just happens; and because I prefer to purchase used equipment, I am always on the look out for bargains that fit the kind of photography I do. So my goal this year is to sell something that I am not using and buy something (at a good price) that I will use. I am sure readers easily can make their own photography resolutions (or goals) for the year we have just begun. What could they be? I can only imagine. I was given an old photograph to copy, and retouch, in time for a Christmas present, which was not a big job. All one needs is a camera, a lens that can focus close up and a tripod. My client had tried unsuccessfully to use a scanner, but I think most digital cameras have a better resolution, and will make a sharper enlargement unless the scanner is one of the few, expensive, high quality models specifically designed to copy film and photographs. All I needed was to select a window in my home with indirect light, and turned off any lights that could alter the proper white balance. My advice is to select ”daylight” instead of “auto” white balance on the camera. I placed the photograph on the floor, and set up my tripod, and made sure I didn’t have any shadows falling on it. I then prepare the camera for readiness by using a level against the front of the lens. I usually like to take several exposures that start two stops under exposed, and eventually go to two stops over exposed, a range of five stops, to ensure that I have a lot of exposure choices when I open the image in PhotoShop for editing. I also prefer to release the shutter by using the camera’s self-timer so I didn’t get camera shake. I retouched using PhotoShop, selected a cloning tool to remove scratches, corrected the old photograph’s faded colour, sharpened the image and made a print. As I said, it is not a big job. You may have an old photo that is starting to fade and crack that records something of your family’s history. Get out your equipment and use my notes as a reference and start copying them. This is a good project for the New Year. Do I write about this next topic every year? Yes, I do, if only to remind photographers that this is a good and fun project in which to partake. Every December my wife and I start preparing for our January calendar, and we like to start January off with a photo that sets our mood for the New Year. Readers know my wife, Linda, and I, always photograph our own monthly calendars. We generally alternate responsibility each month and January will be Linda’s turn, and that will be special because she will be using her new Nikon D300s for the first time. And as any photographer knows, it’s always exciting using a new camera. We like a vertical calendar format with a horizontal picture on top and numbered squares for the month underneath. We find our monthly calendars at http://www.pdfpad.com/calendars each month. They are easy to download and print from various sites on the Internet and if I wish I could cut matt board to which I can glue calendar. Then each month all we have to do is come up with an image to use. The plan is to share, so we will each provide six photographs to produce the calendar for the year. I am looking forward to printing lots of black and white photographs, and selecting the best from them will be enjoyable. This yearlong project will be fun and setting goals for photography is always a good thing. We used to go on a hunt for a calendar every December to hang on our wall for the year. There are lots of calendars out there, but many of the monthly images were weak and not up to the quality we would choose for photography to display on our wall. Yes, there is always an Ansel Adams calendar each year, but we have become very familiar with his work and wanted a change. I have December’s calendar hanging and although I enjoy it (my photograph) I am looking forward to what my wife will come up with for January. I think all serious photographers will enjoy their own photographs each month as calendars. I print my own, but for those that don’t, there are lots of good labs around and 8×11 enlargements are not expensive. You’ll have your own artwork on your wall. Or you can make more than one each month and give it to friends and relatives and let them enjoy your photography.